As you may know, Winter Bike Week starts this Friday! With the frigid temps this week, hopefully we will all be ready to get out there into the balmy above 0° weather. For a complete list of events, check out madisonbikes.org/winterbikeweek. Bike Fitchburg has confirmed that their monthly meeting will be held tonight at Fitchburg Public Library on Lacy Road from 6:30 pm to 8:30 pm. Basset Street Corridor Study Meeting #3 will be tonight from 7 pm to 8:30 at the Madison Senior Center at 330 W Mifflin St.
MEAThead ride is also still on at 7pm from Ford's gym. Bombay Bicycle Club is hosting a special one-time screening of the film Le Ride, Tuesday January 29th at AMC Madison 6 at 6:30 pm. Beverages and socializing at Great Dane Hilldale afterwards. LE RIDE follows Phil Keoghan and his friend Ben Cornell as they attempt to recreate the original route of the 1928 Tour de france. Averaging 240 kilometres a day for 26 days, Phil and Ben traverse both the unforgiving mountains of the Pyrenees and the Alps, on original vintage steel racing bikes with no gears and marginal brakes. Wilson Street Corridor Study Meeting #3 7:00 – 8:30 pm Room 260, Madison Municipal Building. Stay tuned for an action alert! Frozen Assets Fat Bike Ride will take place instead of the race due to lake conditions. More info about the event can be found here. It will start at the east end of Law park at 6:30 pm. More festivities for Winter Bike Week. Check out out madisonbikes.org/winterbikeweek for more details about all of the events. Fat Bike Sled Pull was canceled. We hope everyone has been enjoying the snow and cold weather (yes, it’s really cold, but you all have lots of warm clothes, right?) Many people don’t think about bicycling in weather like this, but between planning for our upcoming Winter Bike Week – Feb 1-8 -- and the city planning for construction season, there is plenty on the calendar. If you are looking for the Winter Bike Week events, make sure to head over to the Madison Bikes Facebook PAGE instead of the group where discussions happen. There will also be a primary for alder and mayor on February 19. Everyone in the city will be able to vote for mayor, and there will be a primary for alder in your area if three or more candidates are running. Then, the two candidates with the most votes will run in the main election on April 2. Madison Bikes is a 501(c)3 organization, so we can’t endorse candidates, but we did co-sponsor a mayoral forum on January 15 at the Central Library. Two transportation-related questions were asked, and you can check out the candidates’ answers here. Thanks to Harald for transcribing the answers! If you’d like to hear all the questions and answers, there is a link to a recording as well. We urge everyone to vote an ask questions of the candidates, if you get a chance. Madison Bikes has sent a longer set of questions – ones we didn’t get a chance to ask at the forum – to the mayoral candidates. We will post the answers when after the January 31 deadline to respond. Early voting starts January 29, so if you aren’t sure who you are supporting, we hope the answers can help you make a decision. Meathead Ride. Starting at 7:00 pm at Ford’s Gym, 2114 Winnebago St, join the group for the weekly no-drop social loop around Lake Monona. Bring your extra layers! The Common Council has two items of interest to bicyclists. They meet at 6:30 pm in Room 210 of the City-County Building, the Council will be passing plans for rebuilding parts of E Wilson, Williamson St, and Blount. This is the project that has been under discussion for quite some time, has been through a bunch of public meetings, and shouldn’t be particularly controversial. It will involve some changes to the streets between Franklin St and Blount that should make biking this stretch and connecting with the Cap City Trail and Lake Monona Path easier. You can take a look at the documents here. Also on the Council agenda is the final lease between Freewheel Bicycle Co and the city for the bike center that will be part of the Judge Doyle Square development. While the lease isn’t all that exciting, you can also see plans for what is going to be inside. Cool. A bike wash, showers, indoor bike storage of various sorts, a small bike shop, public repair station, lockers, and lots more. The Transportation Commission will meet in Room 206 of the Municipal Building, to consider the list of Neighborhood Traffic Management Program (NTMP, also known as traffic calming) projects. If you are interested to see which projects accumulated enough points to receive traffic calming measures, or whether your streets has ever been studied, you can find the list here. A studied location must receive 30 points to be considered for traffic calming. Also on the TC agenda is an update on “Bicycle Facility Planning,” however there are no specific items under consideration, and no further information on line. This appears to be a standing item that will appear on each agenda, along with other transportation updates. However, if you are interested in this meeting on anything else on it, you can either attend the meeting or watch the meeting on line. Also Wednesday, there is a meeting about planning for Burr Jones Field. City Parks will be holding a public input session at 6:00-8:00 pm at Festival Foods - Community Room, 810 East Washington Ave. If you aren’t familiar with Burr Jones Field, think about the big green space that is bounded by the Yahara River, E. Johnson St, E Washington, and the RR tracks behind the strip mall and city fleet services on First St. That’s it. Now that we have snow, there have been a few discussions about winter maintenance. To brine or not brine. How to report a problem to the city. If you want to see what the city says about their winter maintenance of bicycle facilities – in more detail than you probably want – check out this video from a meeting on that topic. The portion of the meeting on winter maintenance is about an hour long! Lots of questions about how to keep warm and safe while riding in winter. Ideas from other cities on reforming their transportation system. 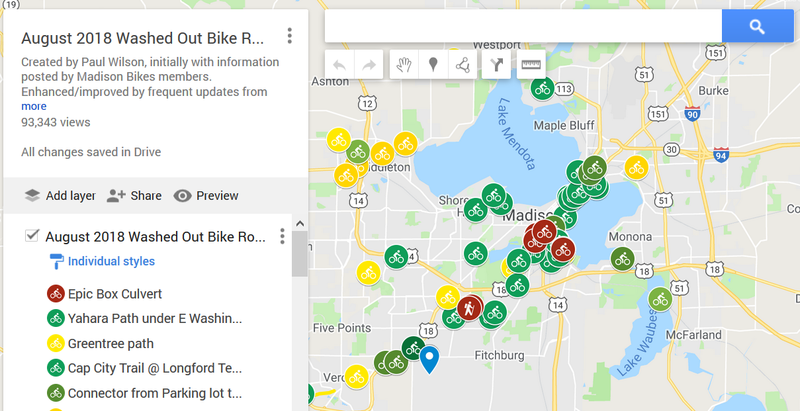 Remember, if you have an event for our Madison Bikes Community Calendar, send it to us so others can find it. And all the details about all the events are up on, or linked from that same calendar, so make sure to visit often. Nicole Nelson is a professor in Medical History and Bioethics at UW-Madison and a year-round bike commuter from Madison's west side. Thanks for writing this great summary of our event "From Madison to Berlin and Back: Civic Activism for a More Livable City," in cooperation with Downtown Madison Inc.
What would biking in Madison look like if we had a law that required the city to mitigate dangerous intersections, install safe cycling infrastructure on main roads, and even build bicycle “highways”? How would such a law come to pass? Dirk von Schneidemesser, a board member for the German nonprofit Changing Cities, spoke about Berlin’s experience with passing a bicycle law to a packed audience at HotelRED on January 4th. Berlin is Germany's capital, with a population of about 3.5 million and about 13% of all trips being done by bike. Bicycle laws are a new phenomenon in Germany. Berlin’s bicycle law, passed in June 2018, was the first of its kind in the country. Now activists in cities across Germany are organizing to put similar laws in place. The Berlin law outlines the types of infrastructure that the city is either required or strongly encouraged to build. Some of these types of infrastructure will be familiar to many cyclists, such as the requirement that the city build 2m/6.5ft wide bike lanes on major streets. Others are more innovative—one provision requires the city to build 100km/60miles of bicycle “highways,” paths with relatively few intersections that allow cyclists to cover more distance in less time. Even though the law is quite recent, it has already resulted in policy change. The city budget for cycling infrastructure increased from approximately 15 million euros in 2015 to 50 million euros in 2019, and the city now employs two bicycle planners for each district, compared to two planners for the entire city before. A ballot initiative organized by the nonprofit Changing Cities was an important step in making the law a reality. “Citizen’s initiatives,” as they are called in Germany, require that organizers first collect 20,000 signatures in a six-month period. The Changing Cities team set up 250 collection stations around Berlin, and in only three and a half weeks they collected more than 100,000 signatures. This caught the attention of city officials, particularly since the signature drive coincided with the beginning of election season for the city. Rather than continuing the “citizen’s initiative” process through to get a question on the ballot, Changing Cities opted instead to work directly with (and sometimes against) elected officials to get the bicycle law passed. One of the most striking aspects of this story was the huge network of volunteers that Changing Cities assembled. Dirk estimated that by the time the law had passed, volunteers had put in more than 40,000 hours of work, equivalent to a single person working full time for approximately 26 years (!). Similarly impressive was the fact that this was all done on a shoestring budget. At the time Changing Cities had no staff and relied primarily on donations to fund basics such as the photocopying needed for the signature drive. There’s a lot to be learned from the tactics that Changing Cities used to lower barriers to participation and grow their network of volunteers. During the signature drive, for example, Changing Cities asked local businesses to volunteer as “collection stations” where citizens could stop in and sign the petition. Not only did this get local businesses more involved in the initiative, it reduced the need to have volunteers staffing booths at fixed locations around the city. Volunteers could roam Berlin (by bike! ), distributing information and encouraging citizens to stop in at a collection station when they were ready to sign. I was also impressed by the variety of techniques the organization used to keep up the pressure on the city to get the law passed. When the city senate was obstructing progress, volunteers rode their bikes into the river to illustrate how bicycle transport and climate protection were “taking a dive.” These humorous and visually engaging protests made for great newspaper photos and headlines. When local merchants complained that the loss of parking spots on major roads would hurt business, Changing Cities worked with merchants to conduct a study of how shoppers arrived at their stores. The survey data showed that merchants tended to overestimate the number of people who arrived by car and underestimate those who arrived by bike, and these data were key to changing merchants’ opinions on the proposed bicycle law. While I’ve tended to think of showy media tactics and evidence-based policy reform as being in tension with each other, this story showed how one organization could do both successfully. Dirk closed his presentation with a map of Germany showing cities that were currently working on bicycle law initiatives, and asked us—could Madison be next? Before Dirk’s presentation I would have answered that a bicycling law for Madison was a lovely, idealistic idea, but an impossible one. After talking us through the process, it now seems difficult but not impossible. As I write this, Cambridge MA (where I am living for the year), is taking its first steps towards passing an ordinance that would require the city to build protected bike infrastructure as described in the city’s own Bicycle Plan. A law that simply forces a city to follow through with its own plans may not seem as sweeping and ambitious as what Berlin achieved, but if successful it would transform the experience of biking in Cambridge. Pushing for legal reforms might not be the best path to success in all cities, but it’s certainly an option worth putting on the table. Our Events and Communication Committees had a very productive meeting last week, all under the auspices of Winter Bike Week. We have a great schedule of events lined up already for February 1-8. Check them out here (and keep checking back for possible additions). 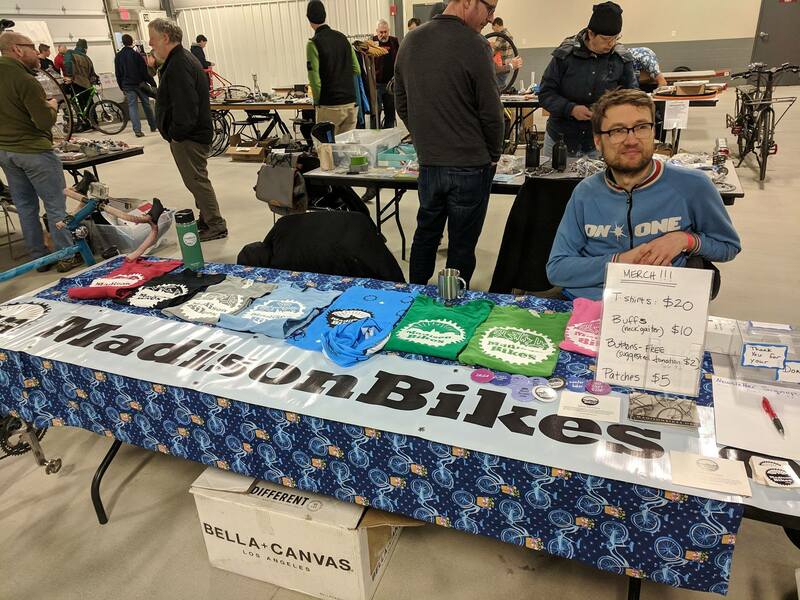 Saturday was a good day to acquire bikes or get rid of them: Madison Bikes had a table at the Brazen Dropouts bike swap at the Alliant Center, while Free Bikes 4 Kidz Madison was collecting used bikes for their annual giveaway. Thanks to everyone who stopped by our table, and congratulations to FB4K for collecting over 1000 used bikes! Let's start our update with some internal Madison Bikes news: Tonight, we're having our first board meeting of the year---and also the first board meeting with our newly elected members. Welcome, Elysha Jones, Jake Foley, Steph Shelton, Peter Taglia, and Jim Wilson! We'll introduce our new members here on the blog shortly. Also a big thanks to our outgoing board members: Becky Jollay, Kevin Mulcahy, India Viola, and Hank Weiss. And while we're having our board meeting, you can join the weekly Monday MEATHead ride. As always, it's a no-drop ride around Lake Monona. 7pm sharp, Ford's Gym on Winnebago. On Tuesday night, it's time for another mayoral candidate forum. At last week's Cap Times forum, transportation and biking hardly featured in the discussion. For Tuesday, Madison Bikes has joined a wide coalition of groups to co-host this forum at the Central Library. Tickets for the main room sold out quickly, but there will be overflow space that you don't need a ticket for. So come and see what the candidates for mayor have to say about transportation and other issues. 6pm, Central Library on Mifflin. On Wednesday, the Madison Bikes Advocacy Committee has their monthly meeting. On the agenda are the continuation of our work on Wilson Street and winter bike facility maintenance. We'll also take some time to talk about our 2019 priorities and goals. Everybody is welcome to join us at Bendyworks, 106 E Doty St #200, 6pm. Could Wilson Street look like this? Consider biking out to Middleton on Thursday: There is a public meeting about the long-awaited path along Century Avenue. Century Avenue and its lack of bike facilities has long been identified as an issue, but now Middleton is moving forward in building a "shared-use path planned along the north side of Century Avenue connecting northeast Middleton with Branch Street and the Pheasant Branch Trail." Eventually that path will connect to the new trail along Highway M, providing access to Governor Nelson State Park and Northwest Madison. 6pm Middleton City Hall. Madison recently had its most heavy snowfall this winter on New Year’s Eve. As a result, the comments Madison Bikes received on our Facebook discussion page about the conditions after the storm were numerous. There was even a discussion among the bikies email group. Some of the comments were positive, especially of the workers who were out clearing the paths. However, several comments showed that more can and should be done to keep the paths safe for winter riders. Madison is undergoing an update to its winter bike-way maintenance policies. This discussion is currently in the hand’s of the City’s Transportation Policy and Planning Board (TPPB). Tonight at 5:00 PM in room 201 in the City County Building at 210 Martin Luther King Jr. Blvd., the TPPB is again going to take up the discussion on winter bike-way maintenance in Madison. We would like to strongly encourage anyone who rode during or after the snow event to come to the TPPB meeting to share their experience, good or bad. You can read the presentation by the Bicycle Facility Maintenance Workgroup to familiarize yourself with the main issues and recommendations the workgroup came up with. Click here for more information about the agenda item. 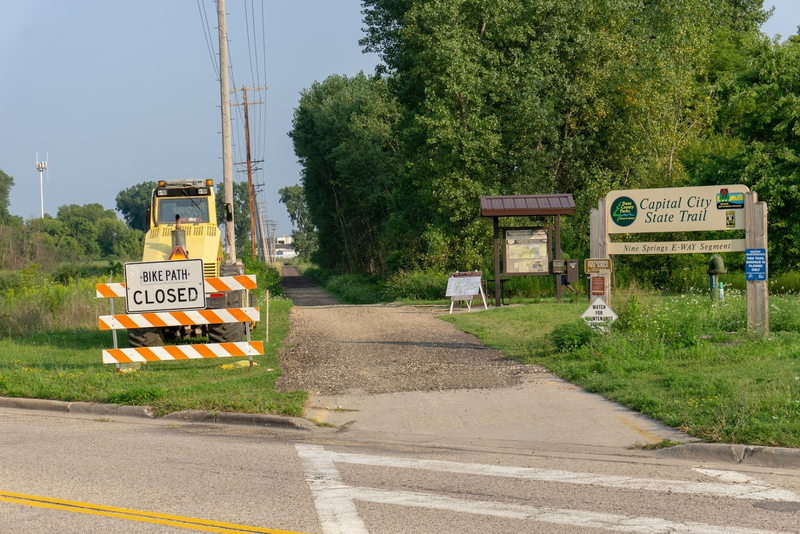 Another announcement: This week, a portion of the Badger State Trail is expected to close for vegetation management for about 4 days. The detour is shown in Figure 2. Click on the image to get a higher resolution version. Future closures from this project are expected on portions of the Cannonball Trail starting next Monday, January 14. Read more about the closures and find detour information here at ATC’s project website. I hope everybody had a good first week of 2019! As mentioned earlier, Madison had a fairly substantial snowfall on New Year’s Eve, but a week of warm weather has mostly melted it. On Friday, there was a talk by former Madisonian Dirk von Schneidemesser about how his and fellow activist’s efforts managed to collect 100,000 signatures for a bike referendum in Berlin and what can be applied from those efforts to activism in Madison. Look for slides and a post soon summarizing that meeting. Today, Monday, January 7, there is the meeting of the TPPB mentioned at the top of this post. Other than the continuing discussion about winter bike-way maintenance policy, the board will be looking at bike infrastructure types, a Metro facility report, and BRT funding options. Additionally, they will be looking at adopting the Oscar Mayer Special Area Report. Here is the full agenda for this meeting. The meeting starts at 5:00 PM in room 201 of the City County Building at 210 Martin Luther King Jr. Blvd. in Madison. At 5:30 PM, the Madison Bikes Communications Committee is meeting at Rockhound Brewing Company, 444 S Park St in Madison. Tonight is also a MEAThead ride. This ride starts every Monday at 7:00 PM November through March regardless of the weather. The ride starts at Ford’s Gym, 2114 Winnebago St in Madison. Read more about the group on their Facebook page. Tuesday, January 8, will be the first Common Council meeting of 2019. One agenda item is Approving Roadway Geometry for the Pleasant View Road Reconstruction, which currently features a sidepath and bike lanes as part of the project. You can see the overhead map here, and the current proposed sections here. The full Common Council agenda can be found here. Wednesday, January 9, Madison’s Transportation Commission (TC) would normally meet, but this meeting has been canceled. However, there will be a meeting of the Madison Area Transportation Planning Board (MATPB). This meeting will start at 6:30 PM at the Madison Water Utility Building at 119 E. Olin Avenue, Room A-B. Read the full agenda packet for this meeting here. After this meeting, in the same room at 6:45 PM, there is a joint meeting between the MATPB and the Capital Area Regional Planning Commission (CARPC). Here is the full agenda packet for this joint meeting. Also this Wednesday, the Capital Times will be hosting the first mayoral debate. The debate starts at 7 PM at The Barrymore Theatre at 2020 Atwood Ave. Read more about the event here. If you can't make it to this debate, Madison Bikes is co-sponsoring another forum on January 15. More details here. Saturday, January 12, is the annual Brazen Dropouts Bike Swap. The bike swap is in the New Holland Pavilion on the Alliant Energy Center Campus. At this event you can find great deals on a variety of bike stuff including parts, accessories, clothing, and more from a wide variety of vendors. Madison Bikes will have a table at the event, so feel free to stop by and say hi! Read more about the Bike Swap here. And if instead of acquiring new bikes, you want to get rid of them, Saturday is also the day for the Free Bikes 4 Kids annual bike collection. Phew! 2018 is almost over! Another busy year for us and for biking in Madison. A big thanks to everyone who supported us in one way or the other. For an all-volunteer organization, support from the community is key -- be it with a one-time or monthly donation, volunteering your skills, joining our newsletter and participating in our action alerts, or just sharing information with us and the community on Facebook or by email. We're excited to see what 2019 is going to bring, but first let's look back at 2018. Some think that January is a quiet month for biking. But for Madison Bikes it was an exciting month, as we welcomed a new cohort of board members: Becky, Liz, Baltazar, and Pepe joined us, and they have been wonderful additions to our organization. January also saw us do a day-long strategic planning exercise to figure out our strengths and weaknesses and to determine short- and long-term goals. And of course our advocacy work never stops, and we kept working toward a better Winnebago Street. February means Winter Bike Week in Madison! While there were some seasonal difficulties--the ice on Lake Mendota was too slick for our fat bike sled pull, and at our Monday commuter station is was so cold that the coffee creamer froze within minutes--, I think we had a great week! With the help of our many partners, there were social rides, bike stations, and more on every day of the week. We will be back for another Winter Bike Week in 2019. Our advocacy efforts for Winnebago Street continued in March. We attended public meetings, wrote blog posts, and encouraged you to also advocate for the project. Another exciting thing in March was that the city posted the job of Director of Transportation, a position Madison hadn't had for decades. The job posting was also part of a general reorganization of the city's decision-making structure on transportation, and we were (and are) optimistic that the changes were a good thing for biking and active transportation in our city. The Winnebago Street that wasn't. April? April. Right, that month that served us a big late-winter snowstorm! And also the month when the big Atwood reconstruction process that had begun in late 2017 started making its way through the city committees. We spent a lot of time and resources on making sure that the new Atwood Avenue wouldn't just serve car commuters but also people walking and biking and enjoying Olbrich Park. May is National Bike Month, and it showed: There were a lot of bikey things happening in Madison. 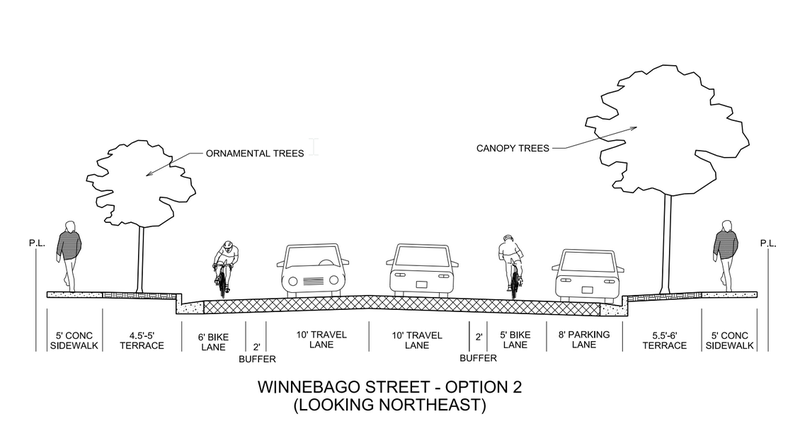 It was definitely the most riveting month for bike advocacy: Because of our tireless work and the support of the community, the Common Council agreed to reconstruct Winnebago with buffered bike lanes. What a disappointment it was then to see Mayor Soglin to use his veto power to block the Council's decision because he "was never comfortable with the concept of Complete Streets." 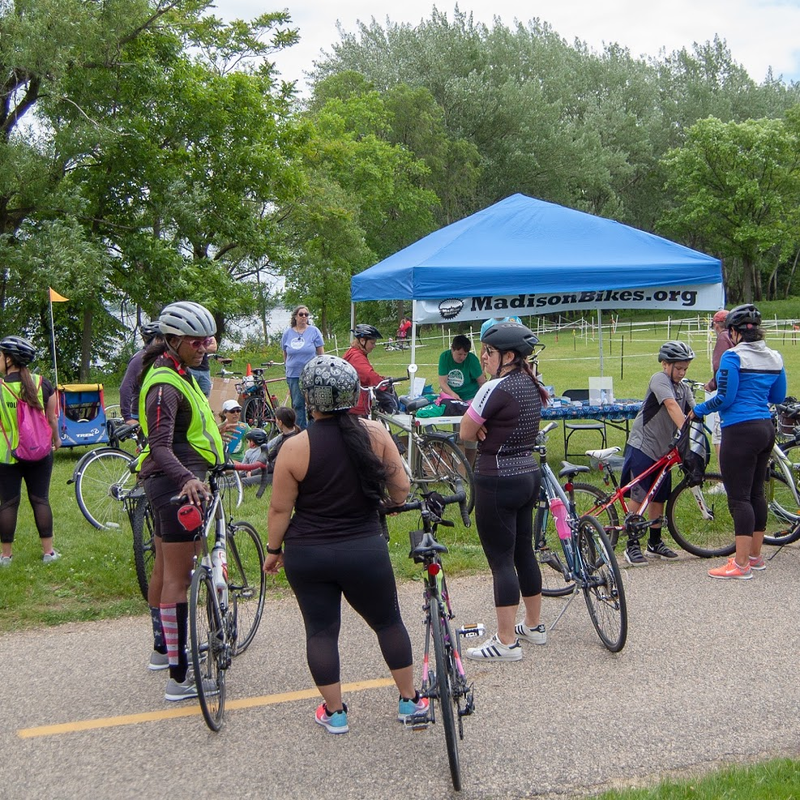 In more positive news, May was also the month when our city's first LatinX bike club formed: BiciClub Latino de Madison has since organized a whole number of rides and events, and their Facebook community has almost 300 members. A great addition to Madison's cycling scene! May also saw the Wisconsin Bike Summit come back to Madison. Our board member Harald presented on our work with mapping Madison's low-stress bike network. The low-stress network, i.e. a connected grid of bike facilities that people of all ages and abilities feel safe and comfortable on, is our organization's top priority, and so it was great to share our work with other advocates from around the state. Related the low-stress network, national bike advocacy group People for Bikes released their US-wide city rating. The low-stress network makes up a significant chunk of the overall score. Madison did quite well, placing 6th overall. But the fact that we only got 3.2 out of 5 total possible points shows that there is still a lot of room for improvement and work to be done. What really dragged down our overall score was the "acceleration" rating. This is an indicator of how bike infrastructure has improved in the recent past, and Madison just hasn't kept up with some of its competitors. One last big event in May was the nomination of Tom Lynch as Madison's Director of Transportation. Tom previously worked with engineering firm Strand Associates, and he's a year-round bike commuter. June's highlight was Bike Week. Our friends from the Bike Fed again did a great job of putting a huge bundle of events. This was also the first year that Ride the Drive took place during Bike Week. Madison Bikes had a great time hosting ABC Quick Checks at Ride the Drive, and in cooperation with HotelRED we hosted a bike commuter station with excellent coffee and baked goods. Biking in Madison is pretty good, but only if you don't compare with the Netherlands. In June, community member Jonathan wrote a series of blog posts about Dutch cycling and what we can learn from them. Highly recommended if you missed them or want to refresh your memory. Part 1, part 2, and part 3. June also saw the end of an era: It was the very last meeting of the Pedestrian, Bicycle, and Motor Vehicle Commission. Several of our board members had been on the commission over the years (most recently: our president Grant). So it was bittersweet to see "PBMVC" go and have it and other transportation-related committees be integrated into the Transportation and Planning Policy Board and the Transportation Commission. Bittersweet because we do believe that the reorganization of the city's departments and commission in the long run is a positive thing. At the Common Council, the Atwood Avenue was approved. We were quite happy with how the plans turned out: While it would have been nice to get safe bike facilities along the whole project, from Fair Oaks to Cottage Grove, the project as approved included many improvements for people biking and walking. July also saw the release of the Metropolitan Planning Organization's (MPO) Low-Stress Mapping tool. 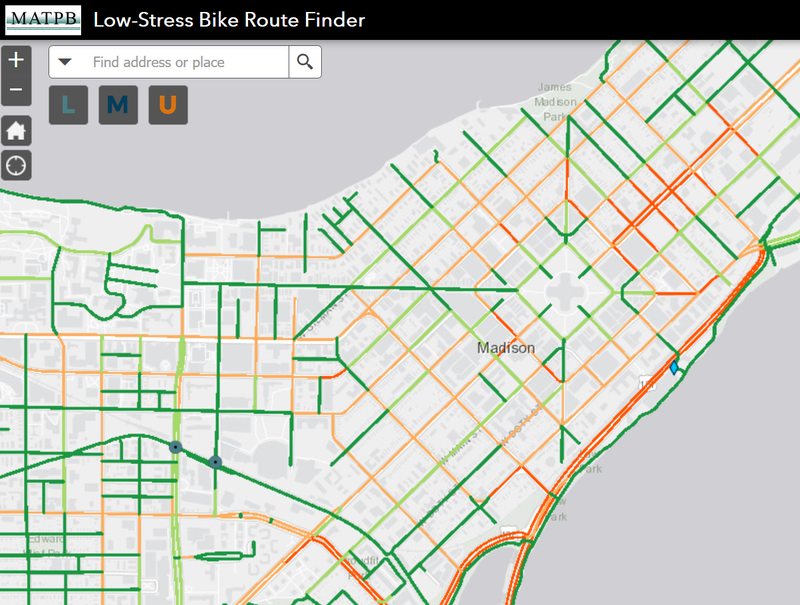 Similar to the People for Bikes tool mentioned above, the MPO analyzed all of Madison's street and classified them by stress level. Levels 1 and 2 are low-stress, i.e. comfortable to ride on for almost everyone, whereas levels 3 and 4 only work for a small minority of people. It's amazing to see how many low-stress facilities we already have in Madison -- and how by closing a few key gaps we could connect the existing network even better. Sharing this kind of timely, actionable information is what Madison Bikes is all about. This, while also giving a place for members to organize their bike advocacy and promote cycling makes them an amazing community resource in Dane County. The flood brought a lot of destruction, but August also saw great new things: We showed off the new Vilas Park bridges, and the new Crazylegs plaza was finished. 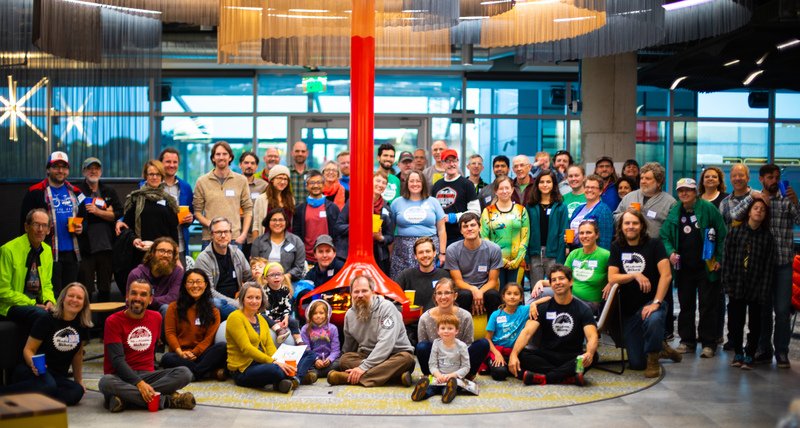 In September, we hosted an awesome party for our members and community. Thanks to Starting Block and American Family Insurance, we got to party in the shiny new Spark Building on East Wash. Thanks for everyone who was able to attend and have a good time with us. We also had the opportunity to participate in a great workshop on the "Art of Bike Commuting" at the Cargo Bike Shop. We know that getting started with bike commuting can be intimidating, and so we were happy to share our knowledge with people new to getting to work by bike. Speaking of people new to biking: The Tour de la Familia Latina celebrated its first birthday in September. The tour, as well as the Unity Rides that started this year have been great in creating a safe and fun space for people who otherwise maybe wouldn't ride their bikes. Big kudos to Baltazar for getting the rides off the ground and for the BiciClub Latino for keeping them going for over a year now. In October, Yang Tao was hired as the city's new Traffic Engineer. Like his boss Tom Lynch, Yang is another year-round bike commuter and we've had many great conversations with him. An insightful take on equity (and its lack) when it comes to bikes in Madison appeared in the Cap Times in October. As part of the Unity Rides, Baltazar who worked for the Bike Fed and is a Madison Bikes board member, took a reporter on a ride of Madison's south side and discussed the inequities in our city's bike infrastructure -- and bike advocacy. In November, we hosted another successful edition of the Winter Bike Fashion Show. 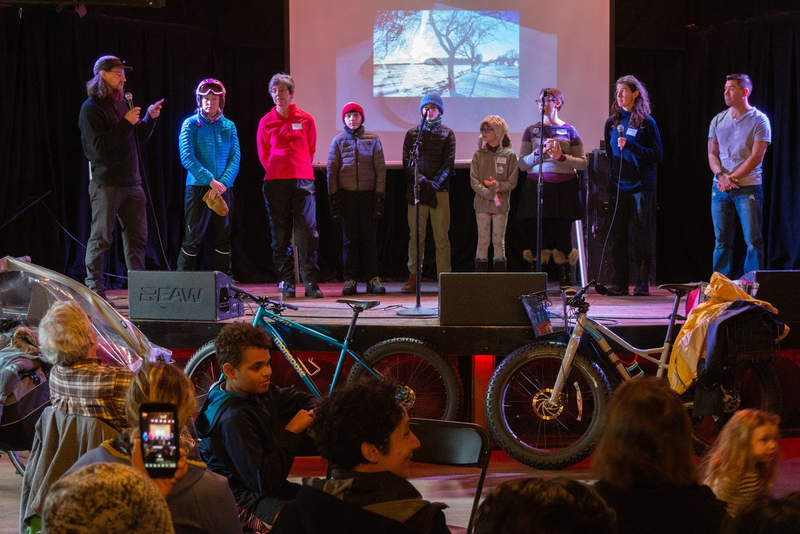 Enabling people to bike year-round is a key part of our organization's vision, and so we were happy to have almost 100 people attend the show and learn from our awesome amateur models. 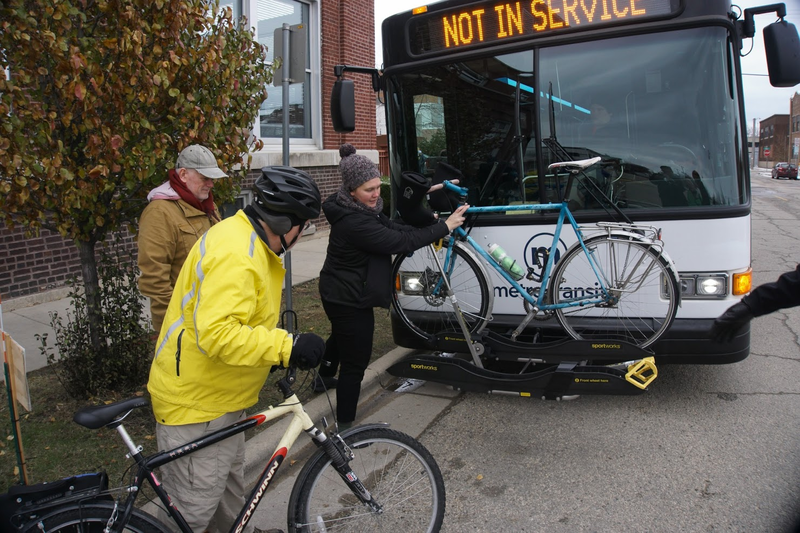 And because especially in winter it can be nice to have the option of taking your bike on the bus, we partnered with Metro. They brought a whole bus to the event so that people could practice using the bike racks without being stressed. In December there was a lot of advocacy to be done again: The public input process for two key downtown corridors -- Wilson and Bassett -- started. We spent a lot of time attending meetings and figuring out how to best accommodate riders of all ages and abilities on their way to the economic and cultural heart of our city, the Capitol Square. Stay tuned for more of that in 2019. Will you help us make Madison better next year? There aren’t any city meetings this week, and many people are out of town, off work, or involved with family activities. There are a few activities coming up, both this week and in the months to come, and we’ll get to those in a minute. But first I want to take this opportunity to ask everyone reading this to think about ways that you can help us in the coming year. 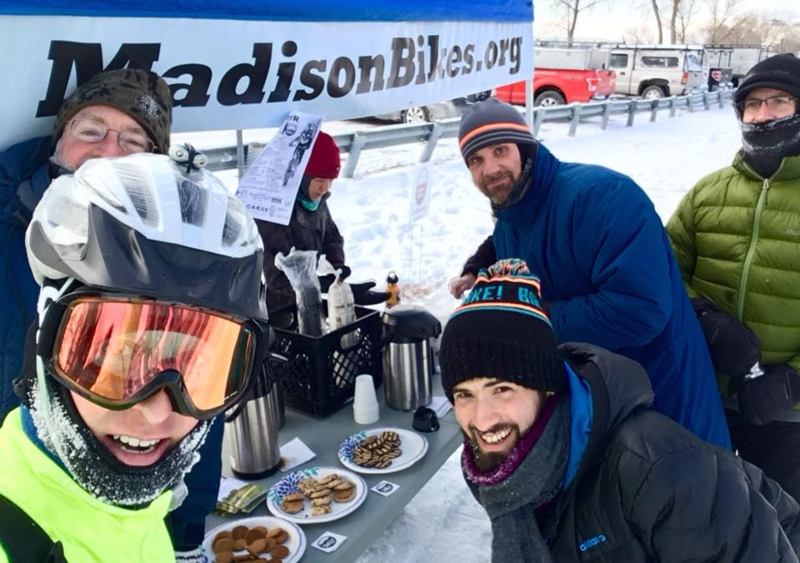 That may be by volunteering at one of our events, coming to a meet to speak or contacting your elected representatives, serving on a Madison Bikes committee, writing a blog post for us, or making a financial donation to Madison Bikes. We are an all-volunteer organization, but that doesn’t mean that we don’t have expenses. We run a lean organization, but we could really use your help, whether that is by your money, your voice, your ideas, or your hands. We are starting to make progress in improving the city for you as bicyclists. But even better, we are starting to move forward toward a city where people who may not feel comfortable biking now can enjoy the freedom to move by bicycle that some of us already do. Imagine if your family member, colleague, friend, or neighbor could finally stop worrying about that bad intersection or the gap in the network that keeps them from biking to work, restaurants, social activities, or shopping. Imagine if you didn’t have to hear, “I’d bike, but….” That’s what we’re working toward. Donate or sign up to volunteer on our website. The Monday Meathead rides are still on the calendar for Christmas Eve and New Years Eve. Meet at Ford’s Gym at 7 pm for a no-drop ride around Lake Monona. Friday, January 4 at 6:00 pm at HotelRED, we will be hosting an event with Downtown Madison, Inc. From Madison to Berlin and Back: Civic Activism For a More Livable City. This isn’t just about bicycling, it’s about becoming more involved in your city and making it more sustainable and livable. We hope you can join us for a discussion with Dirk von Schneidemesser, who is on the board of the Berlin based Organization Changing Cities. More information at the link above. We are also gearing up for the Winter Bike Week, starting Feb 2 with the Frozen Assets Festival on Lake Mendota. Madison Bikes will again have a table out on the ice and will offer fat bike-towed sled pulls. Here’s a great event where we can use your help. During the week following the festival, there will be commuter stations and other activities to encourage everyone to keep biking al winter long. Keep your eyes out for the full list of activities and opportunities to help out. Finally, thanks to everyone who has been there for us the past year, and we all hope you have a safe and joyful biking year to come. Let me start with a quick reminder about our fundraising, membership, and volunteering drive: It's the season when we start planning for the new year, and even an organization like ours that's run 100% by volunteers needs some funding. So please consider making a donation or joining/renewing your membership. Thanks! 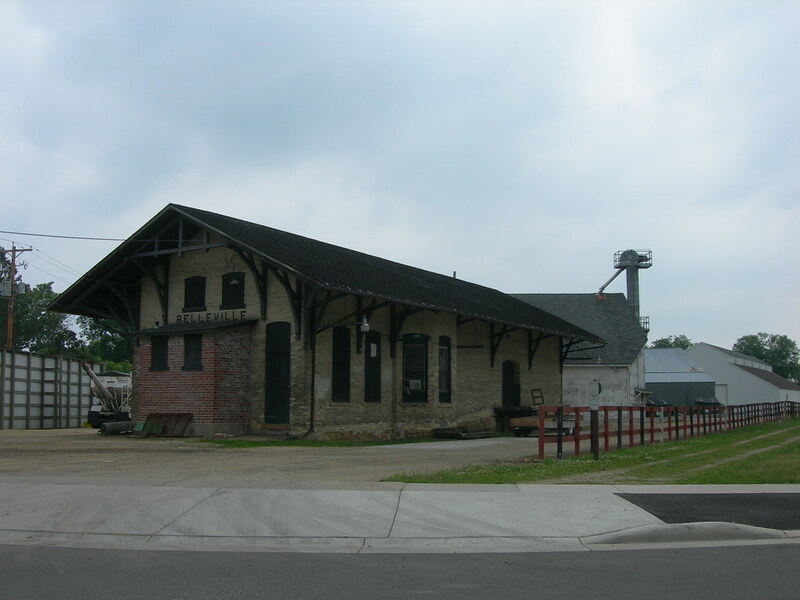 Exciting news for the Badger State Trail: The Wisconsin State Journal reports that Belleville is going to turn its historic train depot on the Badger State Trail into a business serving people biking the trail. Speaking of Madison Bikes: We have our most important board meeting of the year on Monday: It's election day for our board of directors. With eight seats open, we have an exciting roster of candidates on the ballot. Stay tuned for an announcement of the new board members! Also on Monday, join the friendly weekly winter ride around Lake Monona, a.k.a. the MEAThead. Meet at Ford's Gym for a strict 7pm departure. And for a final Monday event, join Bike Fitchburg for their monthly meeting. 7:30 pm, Fitchburg public library. On Tuesday, there will be a public input meeting about Wilson Street. "But didn't they just have two Wilson Street corridor meetings? ", you may be asking. Yes, but this one is for the other end of Wilson Street, near Blount/Willy/John Nolen. It would be nice to have a more integrated process for planning the whole of Wilson Street, and maybe that's a point to make at the meeting. 6:30 pm, Madison Municipal Building, Room 111. On Wednesday, you can join the Madison Bikes Advocacy Committee meeting. We'll definitely talk about Wilson Street, and so if you want to be part of our efforts to make Wilson a better street for people on bikes, join us! 6 pm at the Bendyworks office (106 E Doty St #200). 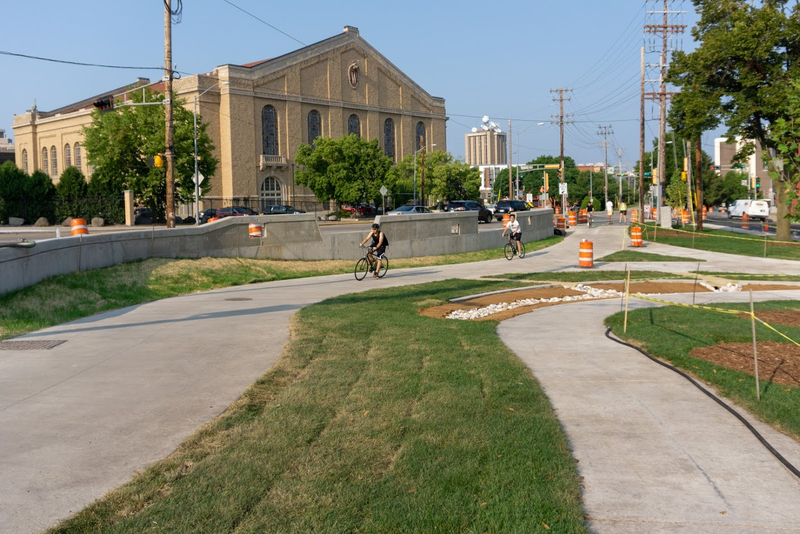 On Thursday, get up early to catch a free webinar on "Jumping in with Both Pedals: Lessons from Rapid Implementation of Cycling Networks." Alain Boulanger from Paris City Hall and Manuel Calvo from EstudioMC in Sevilla will discuss the social, design, and political aspects of forward-thinking mobility, and share insights on the efforts to elevate the state of bike networks in both cities. We could surely use some more rapid implementation of a cycling network in Madison, and there's lots to learn from other cities. On Thursday night, join Revolution Cycles for the "ride that only comes one time a year." Meet at the shop at 6pm, and then roll out at 6:30 for "a slow roll/no drop, counter clockwise to the Holiday Lights at Olin Park. Fat Bikes are encouraged but not necessary." Madison Bikes thanks you so much for your support over the past year! As 2018 comes to a close, we’re kicking off the Madison Bikes 2019 membership drive. If you want to sign up for a new membership or a renew an existing membership, simply complete this form. If you’ve already got your membership for 2019 in place, for example, maybe you got your membership as part of your ticket to the annual party this past September, consider making an extra donation to support Madison Bikes. Thank you for your gift and being part of the Madison Bikes mission. To start this week’s post off, I’d like to highlight an important public meeting happening tonight at 5:00 PM in room 201 in the City County Building at 210 Martin Luther King Jr. Blvd. The City of Madison’s Transportation Policy and Planning Board (TPPB) is going to take up the discussion on winter bike-way maintenance. Although the city is generally good about clearing paths on weekday mornings after snow storms, there is a lot of room for improvement regarding winter bike-way maintenance, especially with respect to on-street bike lanes, and evening and weekend path clearing. Previously, a subcommittee of the Pedestrian, Bicycle, and Motor Vehicle Commission (PBMVC) drafted a list of Bicycle Facility Maintenance recommendations that included many related to winter maintenance. Read the legistar file here for more information about the subcommittee and its recommendations. Many of the recommendations were based on responses collected to a winter bike survey that identified major issues including with on-street bike lanes and the windrows at path/street crossings. This meeting presents another opportunity for the public to comment on winter bike-way maintenance. Since this is the first time the new TPPB is going to hear about this item, it is important to show up and let them know about any issues you regularly encounter while riding throughout the winter, and to support the recommendations of the Bicycle Facility Maintenance Workgroup. Again, this meeting is happening tonight at 5:00 PM in room 201 of the City County Building. Read the full agenda here. On Thursday, the second Public Involvement Meeting (PIM) for the Wilson St. Corridor Study happened, and at the meeting several alternatives were presented for three sections of the corridor: From Broom St. to Henry St., from Henry St. to Butler St., and from Butler St. to Blair St. Read about the study and the proposed alternatives here. For those of us who don’t follow the Madison Bikes Facebook page, there was a good discussion of recommendations for warm winter gloves. Winter biking can be fun and rewarding, and staying warm and comfortable is an important part of making that happen. Also last week, the city opened up a survey to help with the development of an East-West Bus Rapid Transit corridor. The survey is open to everyone, including those who only ride the bus once in a blue moon or never at all. Today, Monday, December 10, there is the meeting of the TPPB mentioned at the top of this post. Other than the discussion about winter bike-way maintenance, the board will be looking at the Wilson St. and Bassett St. corridor studies. Although they are being considered as one agenda item, they are in fact separate studies being done in conjunction with separate projects. There will also be a discussion of transit priorities. Here, again, is the agenda for this meeting. The meeting starts at 5:00 PM in room 201 of the City County Building at 210 Martin Luther King Jr. Blvd. in Madison. Tonight is also a MEAThead ride. This ride starts every Monday at 7:00 PM November through March regardless of the weather. Tonight’s ride is the FreshMEAT ride, so if you’re new to MEAThead rides or just want to boost your winter riding skills, the ride starts at Ford’s Gym, 2114 Winnebago St in Madison. Read more about the group on their Facebook page. Tuesday, December 11, Madison will be having its second Public Information Meeting (PIM) regarding the Bassett St. corridor study. This PIM will feature discussion and alternatives of the Bassett St. corridor from University Ave. to the railroad crossing, and will include the 400 block of W. Wilson St. due to the fact that it is currently used for the Broom-Bassett one way couplet. Read more about this project on the City’s website. Wednesday, December 12, Madison’s Transportation Commission (TC) will have a meeting at 4:30 PM in room 201 of the City County Building. Read the full agenda here. At this meeting, the commission will discuss changes to Metro service on Routes 37 and 38. They will also discuss the quarterly traffic report by Madison Police. There will also be a discussion about Pleasant View Rd. between Mineral Point Rd. and US-14/University Ave.
Also Wednesday, at 6:00 PM in room 302 of Madison Central Library at 201 W. Mifflin St., the city will have its Kickoff Open House on the Madison East-West Bus Rapid Transit (BRT) Planning Study. This will be a great opportunity to connect with City leaders and talk about the BRT planning study. Read more about this Kickoff Open House at the event website. Thursday, December 13, is Madison’s Greener Smarter Future, a presentation and discussion led by Mayor Paul Soglin, Transportation Director Tom Lynch, and Traffic Engineer Yang Tao. They will be discussing the future of Madison’s transportation network and how we can achieve a greener, smarter transportation network. Read more about the event here. The meeting will take place starting at 6:30 PM in room 260 of the newly renovated Madison Municipal Building at 215 Martin Luther King Jr. Blvd. Saturday, December 15, either race your fat bike in Verona for the season opener of the Big Cheese race series. Or join BiciClub Latino de Madison for the Tour de la Familia Latina. The ride starts at 1:00 PM. As of this posting, no further event information is available, so keep an eye out for that, but the ride usually starts at Olin Park near the west shore of Lake Monona.